ISSA/INTERCLEAN® North America 2014, held at the Orange County Convention Center, in Orlando, FL, on November 4-7, was billed as “The Event That Helps You Pack More Punch!” Attending were professionals involved in the global cleaning industry. The trade show featured 700-plus global suppliers — including companies representing the brush, mop, broom, squeegee and related industries — and 16,000 attendees from 78 countries, according to ISSA officials. ISSA/INTERCLEAN® North America showcased an exhibition floor full of manufacturers/suppliers and more than 45 seminars and workshops. Four keynote speakers — corporate business leader and mountaineer Susan Ershler, best-selling author and consultant Marcus Buckingham, University of Louisville men’s basketball coach Rick Pitino and boxing great Sugar Ray Leonard — were among the many highlights of the event. 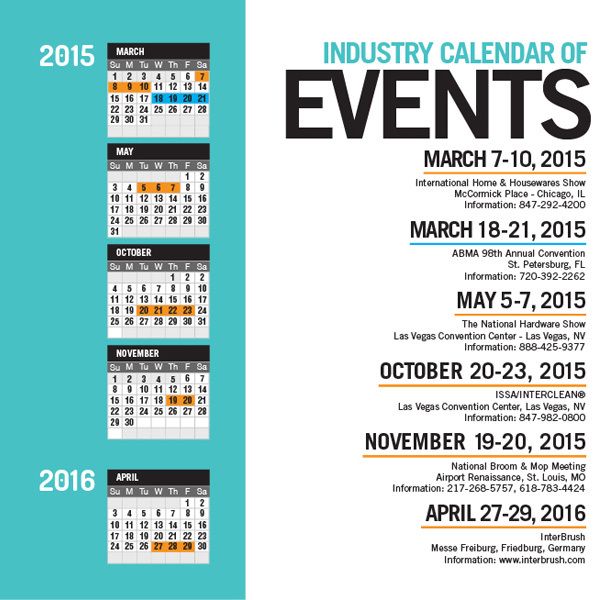 In addition to ISSA’s trade show, five other industry-related conventions also took place during ISSA/INTERCLEAN® North America. These were: the Association of Residential Cleaning Services International (ARCSI), the Building Service Contractors Association International (BSCAI), the Cleaning Equipment Trade Association (CETA), IEHA-Uniting Facility Managers Worldwide, and the International Window Cleaning Association (IWCA). 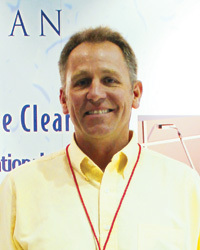 During the recent ISSA/INTERCLEAN®, Broom, Brush & Mop Magazine spoke with representatives of four manufacturers of cleaning products who exhibited at the event. The four executives shared their goals for attending the show and some of the products their respective companies highlighted. ISSA/INTERCLEAN® North America 2014 marked nearly seven decades that the Haviland Corporation, of Linn, MO, has attended ISSA trade shows. The company specializes in the manufacture of high quality floor, window and grill squeegees; waterbrooms; stainless steel squeegees and scrapers; hand-held paving tools; splashguards; gaskets; and blades for floor machines and wet-dry vacuums. One of the products Haviland Corp. highlighted was its new Easy Clean Whiteboard Dry Eraser™. The product removes dry eraser ink from whiteboards. In the past, according to Haviland, many teachers told Haviland representatives the odor of the chemical product used to clean whiteboards was unpleasant, and their current erasers were not removing the ink completely. “The Easy Clean Whiteboard Dry Eraser™ cleans whiteboards without the use of chemicals and is long-lasting,” Haviland said. The product cleans without leaving any residue and creates a more eco-friendly and safe environment for the classroom, according to Haviland. “Another product we are highlighting is our Microbe Spiker™, anti-microbial squeegee that will pick up microbes off a surface without the use of any other chemicals,” Haviland said. According to Haviland Corp., the Microbe Spiker is a blue double foam rubber squeegee embedded with an antimicrobial agent that attracts and attacks surface microbes by physical means. There is no opportunity for cell adaptation or development of microbial resistance. Because the agent is embedded into the entirety of the foam, it does not lose potency. The product can be used on wet or dry surfaces and destroys up to 99.9 percent of surface microbes, including the MRSA (methicillin-resistant Staphylococcus aureus) bacteria. Haviland Corp. touts its commitment to making its products with American-made components. Since the recent recession, business has been “improving,” Haviland said. P.O. Box 769, 200 S. Highway U, Linn, MO 65051. 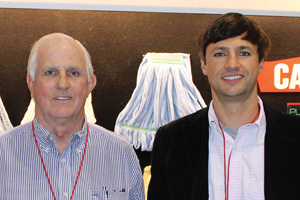 Celebrating seven decades in business in 2015, Carolina Mop Company, of Anderson, SC, continues to supply the cleaning industry with high quality mop and broom products. Ritter said the company’s primary goal in attending the event was to seek new clients and meet with existing customers. Since its founding by Mr. and Mrs. Teasley A. Moorhead, the company has prided itself in the use of technological and manufacturing advances as well as innovative buying. 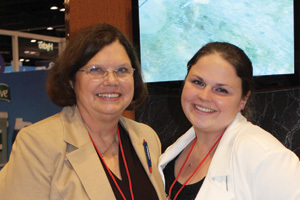 Carolina Mop remains dedicated to quality, fair pricing and excellent service, according to Ritter. In today’s world, where outbreaks of viruses and infectious diseases often make headlines, Carolina Mop highlighted a new product the company calls an “Ebola virus fighter” mop during the ISSA/INTERCLEAN show. 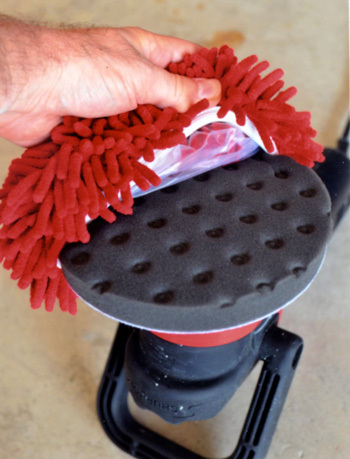 “Our new disposable mop helps fight viruses and diseases as it is designed to be used once and thrown away,” Ritter said. Carolina Mop’s product offerings include wet mops, handles, dust mops and brooms. The company also sells environmentally friendly microfiber cleaning tools. Another area Carolina Mop has built its reputation around is offering the best in customer service, which includes quick turnaround times. The company’s motto is: “We ensure you get exactly what you want.” Establishing and maintaining long-term relationships with customers is key, according to company officials. P.O. Box 5072, Anderson, SC 29623. 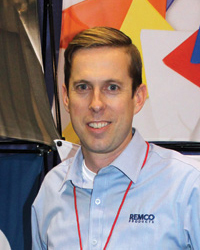 Displaying its color-coded product options at the ISSA/INTERCLEAN trade show was Remco Products. The Zionsville, IN, company provides material handling and cleaning supplies used in food processing sanitation programs and industrial cleaning applications where hygiene and safety are critical. “One of our goals in exhibiting at ISSA/INTERCLEAN is to gain exposure to potentially new distributors, as well as seeing our existing customers,” said Remco Business Development Director Rob Middendorf. According to the company, Remco offers its own manufactured line of material handling tools and the Vikan® line of cleaning tools. “It has been a good year. We have some big goals for 2015, so we want to keep on track,” Middendorf said. Remco was founded by Richard L. Garrison, and, according to the company, the introduction of a one-piece polypropylene shovel more than 30 years ago established it as an industry pioneer. Remco’s product lines have expanded over the years to include a dozen shovel models, hand scoops, hand scrapers, bench scrapers, a food hoe, mixing paddles, hazmat squeegees and handles, a ceiling squeegee system, and three sizes of tubs with related undercarriages. The company says one of the major advantages of Remco’s products is color-coding, which it has been offering for 15-plus years. Color-coding helps prevent cross contamination when using material handling and cleaning products. Remco’s product lines include Vikan Professional Cleaning Tools and Remco Plastic Moldings. Vikan offers a full line of brushes, squeegees, handles, and specialty products. Remco has been the exclusive U.S. distributor for Vikan for more than 25 years. The Remco Plastic Moldings line includes molded products, such as shovels, scoops and scrapers as well as some manufactured items. According to the company, Remco serves distributors in a variety of markets, ranging from food processing and pharmaceuticals to the safety and industrial markets. The company has established a strong position domestically, as well as a significant international presence. “Projections for the future of Remco look good,” Middendorf said. The Ettore Products Company, of Alameda, CA, was founded in 1936 by Ettore Steccone, who came to the United States from Italy in the early 1920s. After arriving in America, Steccone pursued window cleaning as a profession, but was unhappy with the equipment he was using. Today, the Ettore company is owned by Steccone’s daughter, Diane Smahlik, and offers around 700 products in its professional and retail lines. One of the company’s representatives at the ISSA/INTERCLEAN event was Vice President-Sales Wayne Schultz, who said, “The (ISSA/INTERCLEAN) show provides networking opportunities to interact with our current customers and, hopefully, some new customers and vendors. We are also here to keep a pulse on the industry and what is happening in the marketplace. “We are highlighting our flagship window cleaning products — the tools necessary to accomplish the process of window cleaning. We have improved and created some new products, but we really haven’t deviated from our core lines for about 80 years. That is basically what we do and we do it very well. Ettore’s product categories include squeegees and rubber; T-bars and sleeves; poles; scrapers; buckets; floor care; dusters and high reach; holsters and belts; cleaners and soap; auto and cleanup; and pure water systems. When it comes to squeegees, Steccone’s original design has remained virtually unchanged since its inception in 1936. According to the company, the secret to the product’s longevity is in the rubber used to make the blades for Ettore squeegees. The ingredients in Ettore rubber are a carefully guarded company secret. The rubber features a razor sharp square edge and is supple, smooth and consistent, which leaves glass clean and streak free. Looking ahead, Schultz sees a world and a marketplace that is changing at a rapid pace. “The world is changing quickly. With the Internet and other modern technologies, the way people purchase, what they buy, when they buy it, how it is delivered — all are changing,” Schultz said. “At Ettore, we are doing everything we can to make sure we are prepared for the changes ahead. “A lot of effort and input is happening online. Whether it is communication, social media, purchasing on a website, or whatever, we are looking at all of these areas to try to stay on top of the marketplace. 2100 North Loop Road, Alameda, CA 94502. Import totals for the first nine months of 2014 were down in four finished goods categories outlined: toothbrushes, hairbrushes, paint rollers and paintbrushes compared to the first nine months of 2013. In September 2014, six categories outlined recorded increases: brooms and brushes of vegetable material, toothbrushes, shaving brushes, paint rollers, paintbrushes and upright brooms. The United States imported 8,747 kilograms of hog bristle in September 2014, down 80 percent from 44,621 kilograms imported in September 2013. During the first nine months of 2014, 193,543 kilograms of hog bristle were imported, down 31 percent from 281,507 kilograms imported during the first nine months of 2013. China sent 192,862 kilograms of hog bristle to the United States during the first nine months of 2014. The average price per kilogram for September 2014 was $26.53, up 41 percent from the average price per kilogram for September 2013 of $18.83. The average price per kilogram for the first nine months of 2014 was $14.56, up 15 percent from the average price per kilogram of $12.67 for the first nine months of 2013. The import total of broom and mop handles during September 2014 was 1.4 million, down 36 percent from 2.2 million for September 2013. During the first nine months of 2014, 13.4 million broom and mop handles were imported, up 6 percent from 12.6 million for the first nine months of 2013. During the first nine months of 2014, the United States received 7.9 million broom and mop handles from Brazil, 2.6 million from Honduras and 1.8 million from China. The average price per handle for September 2014 was 94 cents, up 52 percent from 62 cents for September 2013. The average price for the first nine months of 2014 was 92 cents, up 12 percent from 81 cents for the first nine months of 2013. September 2014 imports of brush backs totaled 438,087, down 32 percent from 644,797 for September 2013. During the first nine months of 2014, 4.8 million brush backs were imported, down 23 percent from 6.2 million for the first nine months of 2013. Canada sent 2.3 million brush backs to the United States during the first nine months of 2014, while Sri Lanka shipped 2 million. The average price per brush back was 42 cents during September 2014, down 13 percent from 48 cents for September 2013. For the first nine months of 2014, the average price per brush back was 45 cents, down 4 percent from the average price for the first nine months of 2013 of 47 cents. The import total of metal handles during September 2014 was 2.2 million, up 38 percent from 1.6 million for September 2013. During the first nine months of 2014, 23.2 million metal handles were imported, up 13 percent from 20.6 million for the first nine months of 2013. During the first nine months of 2014, Spain exported 9 million metal handles to the United States, while Italy shipped 6.8 million and China sent 6.5 million. The average price per handle for September 2014 was 85 cents, up 42 percent from 60 cents for September 2013. The average price for the first nine months of 2014 was also 85 cents, up 27 percent from the average price for the first nine months of 2013 of 67 cents. The United States imported 672,103 brooms of broom corn valued at more than 96 cents per broom during September 2014, down 3 percent from 691,407 for September 2013. During the first nine months of 2014, 6.1 million brooms of broom corn were imported, the same as for the first nine months of 2013. Mexico shipped nearly all of the brooms to the United States during the first nine months of 2014. The average price per broom for September 2014 was $2.50, up 4 percent from the average price for September 2013 of $2.41. The average price per broom for the first nine months of 2014 was $2.51, up 3 percent from $2.44 for the first nine months of 2013. The import total of brooms and brushes of vegetable material during September 2014 was 258,528, up 41 percent from 183,505 brooms and brushes imported during September 2013. During the first nine months of 2014, 1.8 million brooms and brushes were imported, up 20 percent from 1.5 million for the first nine months of 2013. Sri Lanka exported 1.2 million brooms and brushes to the United States during the first nine months of 2014. The average price per unit for September 2014 was $1.06, down 15 percent from $1.24 for September 2013. The average price for the first nine months of 2014 was $1.43, up 22 percent from the average price recorded for the first nine months of 2013 of $1.17. The United States imported 93.9 million toothbrushes in September 2014, up 7 percent from 87.8 million imported in September 2013. During the first nine months of 2014, 757 million toothbrushes were imported, down 6 percent from 803.8 million imported during the first nine months of 2013. China sent 557.3 million toothbrushes to the United States during the first nine months of 2014, while Vietnam shipped 44.6 million. The average price per toothbrush for September 2014 was 25 cents, the same as for September 2013. The average price for the first nine months of 2014 was 24 cents, up 20 percent from 20 cents for the first nine months of 2013. September 2014 imports of hairbrushes totaled 2.6 million, down 26 percent from 3.5 million for September 2013. During the first nine months of 2014, 26 million hairbrushes were imported, down 36 percent from 40.9 million for the first nine months of 2013. China shipped 25.8 million hairbrushes to the United States during the first nine months of 2014. The average price per hairbrush was 30 cents during September 2014, the same as the average price for September 2013. For the first nine months of 2014, the average price per hairbrush was 27 cents, up 1 cent from the average price for the first nine months of 2013. The United States imported 14.4 million shaving brushes in September 2014, up 85 percent from 7.8 million imported in September 2013. During the first nine months of 2014, 84.4 million shaving brushes were imported, up 44 percent from 58.5 million imported during the first nine months of 2013. Germany sent 38.6 million shaving brushes to the United States during the first nine months of 2014, while China shipped 33.1 million. The average price per shaving brush for September 2014 was 10 cents, down 1 cent from the average price for September 2013. The average price for the first nine months of 2014 was also 10 cents, down 17 percent from the average price for the first nine months of 2013 of 12 cents. The import total of paint rollers during September 2014 was 5.1 million, up 21 percent from 4.2 million recorded for September 2013. During the first nine months of 2014, 40.3 million paint rollers were imported, down 15 percent from 47.3 million during the first nine months of 2013. China sent 30.8 million paint rollers to the United States during the first nine months of 2014, while Mexico exported 6.8 million and Germany shipped 1.6 million. The average price per paint roller for September 2014 was 47 cents, down 1 cent from the average price for September 2013. The average price for the first nine months of 2014 was 50 cents, up 9 percent from the average price of 46 cents for the first nine months of 2013. U.S. companies imported 20.1 million paintbrushes during September 2014, up 14 percent from 17.6 million paintbrushes imported during September 2013. Paintbrush imports for the first nine months of 2014 were 171.1 million, down 6 percent from 182.7 million recorded for the first nine months of 2013. China shipped 154.4 million paintbrushes to the United States during the first nine months of 2014. The average price per paintbrush for September 2014 was 32 cents, down 1 cent from September 2013. The average price for the first nine months of 2014 was 30 cents, down 6 percent from 32 cents for the first nine months of 2013. The total import of upright brooms for September 2014 was 1.2 million, up 17 percent from 1 million for September 2013. During the first nine months of 2014, 11.1 million upright brooms were imported, up 19 percent from 9.3 million imported during the first nine months of 2013. China sent nearly all of the upright brooms to the United States during the first nine months of 2014. The average price per broom for September 2014 was $1.32, up 4 percent from the average price for September 2013 of $1.27. The average price per broom for the first nine months of 2014 was $1.55, up 18 percent from $1.31 for the first nine months of 2013. Export totals for the first nine months of 2014 were down in three categories outlined: broom and brushes of vegetable materials, shaving brushes and paintbrushes. In September 2014, four categories outlined reported increases: toothbrushes, shaving brushes, artist brushes and paintbrushes, compared to September 2013. The United States exported 4,898 dozen brooms and brushes of vegetable materials during September 2014, down 34 percent from the September 2013 total of 7,470 dozen. Exports of brooms and brushes of vegetable materials during the first nine months of 2014 were 49,770 dozen, down 47 percent from 94,260 dozen for the first nine months of 2013. The United States sent 23,297 dozen brooms and brushes to Canada during the first nine months of 2014. The average price per dozen brooms and brushes was $39.06 in September 2014, down 20 percent from $49.13 for September 2013. The average price per dozen brooms and brushes for the first nine months of 2014 was $40.45, up 7 percent from $37.88 for the average price per dozen for the first nine months of 2013. During September 2014, the United States exported 30.9 million toothbrushes, up 124 percent from the total recorded in September 2013 of 13.8 million. During the first nine months of 2014, 128 million toothbrushes were exported, up 19 percent from 107.9 million exported during the first nine months of 2013. The United States exported 43.1 million toothbrushes to Canada during the first nine months of 2014, while sending 22.9 million toothbrushes to Mexico and 20.6 million to Germany. The average price per toothbrush for September 2014 was 23 cents, down 48 percent from 44 cents for September 2013. The average price per toothbrush for the first nine months of 2014 was 43 cents, down 12 percent from 49 cents for the first nine months of 2013. The United States exported 992,012 shaving brushes during September 2014, up 43 percent from 695,164 shaving brushes exported for September 2013. During the first nine months of 2014, 10.6 million shaving brushes were exported, down 43 percent from 18.5 million during the first nine months of 2013. Mexico imported 3.1 million shaving brushes from the United States during the first nine months of 2014, while Canada received 2.7 million, and Brazil was sent 2.3 million. The average price per shaving brush for September 2014 was $1.59, down 15 percent from the average price for September 2013 of $1.87. The average price for the first nine months of 2014 was $1.37, up 114 percent from 64 cents recorded for the first nine months of 2013. 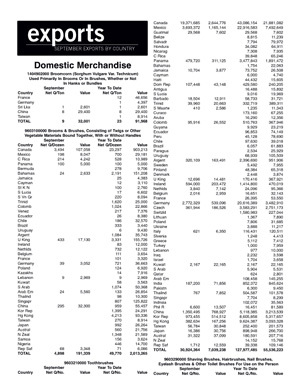 September 2014 exports of artist brushes totaled 1.1 million, up 91 percent from the September 2013 total of 577,352 artist brushes. During the first nine months of 2014, 8.3 million artist brushes were exported, up 12 percent from 7.4 million for the first nine months of 2013. Canada received 5 million artist brushes from the United States during the first nine months of 2014. The average price per artist brush was $2.27 during September 2014, down 37 percent from the average price for September 2013 of $3.59. For the first nine months of 2014, the average price per artist brush was $2.56, down 11 percent from the average price for the first nine months of 2013 of $2.87. The export total of paintbrushes during September 2014 was 151,228, up 8 percent from 140,228 for September 2013. During the first nine months of 2014, 1.2 million paintbrushes were exported, down 14 percent from 1.4 million during the first nine months of 2013. Canada imported 473,829 paintbrushes from the United States during the first nine months of 2014. The average price per paintbrush for September 2014 was $14.18, up 5 percent from $13.55 for September 2013. The average price for the first nine months of 2014 was $16.15, up 23 percent from $13.12 recorded for the first nine months of 2013. Pictured, left to right, are Zahoransky USA President Artur Seger and General Manager Vasko Naumovski. Zahoransky USA has announced the hiring of full-time management and staff to further concentrate the company’s efforts in serving the United States and Canadian marketplace. “To achieve this, Zahoransky USA separated operations from Franklin Automation, of Sugar Grove, IL, at the beginning of 2015, and will hire new personnel and relocate to a new facility. This move is the result of a global strategic decision to have wholly-owned subsidiaries in place. Personnel will include Zahoransky USA General Manager Vasko Naumovski, two technical sales managers, a service technician and an office assistant. Artur Seger will continue in his role as president of Zahoransky USA, working from Germany. Jack Kee will continue to provide service for the company,” said Zahoransky officials. The new Zahoransky USA office will be located in the western suburbs of Chicago, IL. Inventory that is in Sugar Grove will be moved to the new location. Additional inventory will be added. Franklin Automation officials will be concentrating on their company’s own business, but will continue to support Zahoransky USA during this transition and cooperate with future projects, according to Zahoransky USA. Zahoransky officials said they especially thank the Franklin Automation team, including Frank Kigyos Sr., Frank Kigyos Jr., and Kevin Kigyos, for their work over the past 18 years. “We will continue to cooperate with Franklin Automation and, most importantly, we will continue to be friends on a personal basis,” said Zahoransky officials. 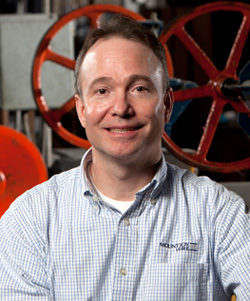 Jon Stine, Mount Joy Wire's new general manager. Jon Stine has been appointed general manager of the Mount Joy Wire Corporation, an American manufacturer of specialty steel wire. Stine, of Elizabethtown, PA, is now responsible for overseeing production, scheduling, maintenance, quality, product and process development and technical customer services activities, according to Mount Joy Wire CEO Tom Duff. Stine joined the company in 1992 as a process engineer and later became quality manager, director of process engineering, director of technical services and plant manager. Stine previously worked six years at Caterpillar’s Peoria, IL, and York, PA, plants in laser engineering and heat treating. While at Caterpillar, he developed a proprietary laser welding process and installed Caterpillar’s first production laser welder. A member of the American Wire Producers Association, Stine received a Bachelor of Science degree in metallurgical engineering from the University of Pittsburgh’s School of Engineering. For more than 20 years, Mount Joy Wire has been a manufacturer of spring wire, oil tempered wire and specialty wire for the agricultural, aerospace, architectural, automotive, building products, construction, household goods, manufacturing, marine, medical, oil and gas, and recreational industries. “The company’s flagship music wire product, AmeriCoat™, is known for its quality and resistance to material degradation,” said the company. The company manufactures all wire products in its Mount Joy, PA, facility and ships to customers across the globe. Visit www.mjwire.com for more information. Wooster's new Pro/Doo-Z® FTP™ and Super/Fab® FTP™ lines. 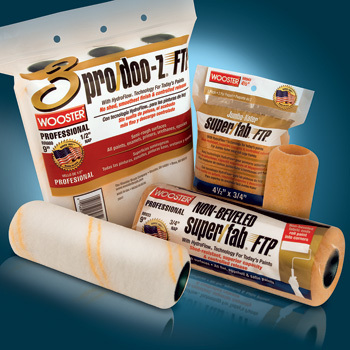 Super/Fab FTP and Pro/Doo-Z FTP with HydroFlow technology are the first Wooster roller lines to be released in new zip-seal 3-packs; they may be ordered as open-stock items or in bulk side stack displays. New 3/4-inch nap Non-Beveled Super/Fab FTP makes it possible to paint into corners and skip cutting-in with a brush. The company has added 4- and 7-inch sizes. Shurhold's Pro Polish and Brite Bonnet in tandem. “Surface scratches and oxidation can be removed with Shurhold Industries’ Dual Action Polisher. The best way to get back a showroom shine is to use the polisher with Shurhold’s Pro Polish Pad and Brite Bonnet. Together, they remove oxidation and surface scratches, while delivering a shiny surface,” said the company. The Pro Polish black foam polishing and waxing pad is designed for specific applications. Measuring 6.5 inches in diameter, its dimpled pattern helps the pad stay cool and work efficiently. It is designed to leave behind a smooth finish, and works best when used with Shurhold’s Pro Polish. This pad should be washed after each use with soap and lukewarm water. The Brite Bonnet is a shaggy microfiber pad used to remove excess wax and to buff the surface to a final shine. This pad is designed with a vapor barrier inside so it can be fitted over a wet wax pad for quick use. The user can stretch the pad and fit it over Shurhold’s Pro Polish Pad. For cleaning, it can be hand washed and air dried.